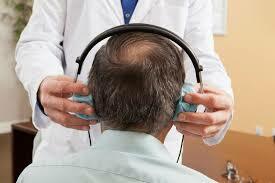 Let KSA Occupational Services bring audiometric testing to your location(s) according to your schedule. Our screening services are federally standard compliant and clinically sound. Health tests are professionally reviewed by our physicians or consulting audiologists, as applicable, giving your employees reliable recommendations. Our prices are competitive and our testing is accurate and reproducible. KSA Hearing Conservation will come to your facility with our state-of-the-art microprocessor audiometers. With no extra on-site setup fee we can take care of your OSHA-required hearing-conservation training and test between 24-30 employees every hour. We also provide retests, make-up tests and work-related reviews. Our calibrated sound-level meter assures that ambient noise will not interfere with your hearing tests. KSA Occupational Services conducts fit tests for all brands and types of respirators from SCBA masks to N-95 dust masks. We also provide OSHA Respirator Medical Evaluation Questionnaire with PLHCP to perform the medical evaluations. We provide respiratory fit testing services at your site. Demonstration of user seal checks. Review of the condition of respirators and care recommendations. Quantitative respirator fit test using TSI Portacount Pro + . Fit testing documentation for both employee and company. Our audiometers are computer-controlled and exceeds all ANSI S3.6-1989 requirements. Upon completion of all testing, the data is reviewed, adjusted for age (as required), compared against baseline and finalized. All employees with a presumptive STS are identified and reports are returned to your designated representative, usually within 72 hours. Data is provided in PDF form for easy assimilation into your company’s files. In addition, we provide the required employee notification letters at no additional charge, relieving you of that regulatory burden. 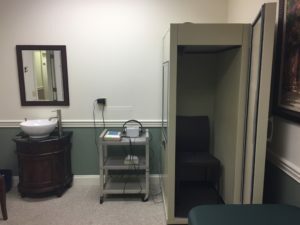 Not only do we have mobile units for on-site testing, we have two offices in middle Tennessee where repeat testing for those with a presumptive STS can be assessed. KSA Hearing Conservation is flexible and can schedule according to your needs. That means your third-shift employees can be tested on third shift, reducing employee disruption and lessening downtime. The National Institute for Occupational Safety and Health (NIOSH), Spirometry Training Program is responsible for approving course sponsors to train participants on how to perform spirometry, a type of lung function test. NIOSH-approved spirometry training is required by Federal Law for individuals performing spirometry testing on workers exposed to cotton, coal, and silica dusts. In March, 2016, OSHA promulgated the Respirable Crystalline Silica standard. Along with the Cotton Dust standard of 1978, the OSHA Silica regulation mandates completion of a NIOSH approved spirometry course for technicians performing spirometry as part of the silica medical surveillance exam. See the Silica Medical Surveillance requirements (29CFR1910.1053(i)). In addition, since 2013, OSHA has recommended completion of a NIOSH-approved course as best practice for all occupational spirometry technicians. See OSHA's Guidance on Spirometry Testing in Occupational Health Programs: Best Practices for Healthcare Professionals for details. NIOSH also requires that technicians performing spirometry tests have completed a NIOSH-approved course if clinics want to become "NIOSH-approved Spirometry Clinics" to test coal miners as part of the Coal Workers' Health Surveillance Program (CWHSP). See the Coal Workers' Health Surveillance Program for details. Certificates of successful completion of a NIOSH-approved spirometry course remain active for 5 years and 7 months from the course date. Certification can be extended in 5 year increments by completing a NIOSH Approved Spirometry Refresher course before the current certificate expires.